To perform a safe and precise laparoscopic surgery for the splenic flexure cancer, it is important for surgeons to gain a preoperative understanding of the running of the feeding artery of the splenic flexure. We evaluated the blood supply to the splenic flexure by using preoperative three-dimensional computed tomography (3D-CT). 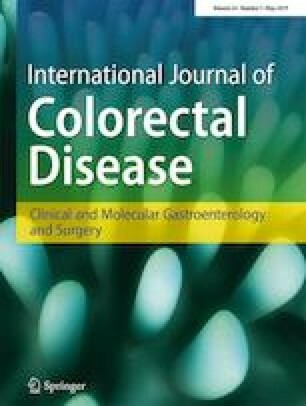 We retrospectively analyzed a total of 88 patients with colorectal cancer who underwent preoperative 3D-CT at our institutions between April 2016 and June 2017. The arterial blood supply to the splenic flexure was divided into four patterns as follows: type 1, the left branch of the middle colic artery (MCA) with common trunk and the left colic artery (LCA) (n = 48, 54.5%); type 2, the left branch of the MCA with independent origin and the LCA (n = 8, 9.1%); type3, the accessory-MCA (A-MCA) and the LCA (n = 27, 30.7%); and type4, the LCA alone (n = 5, 5.7%). The MCA had the common trunk of the right and left branches in the majority of cases (85.2%). The right and left branches of the MCA arose separately from the superior mesenteric artery (SMA) in 8 of 88 patients (9.1%). The arterial patterns of the splenic flexure were classified into four patterns by using preoperative 3D-CT. The A-MCA existed in 30% of the patients in this study. These information should be helpful to perform the optimal surgery for the splenic flexure cancer. We would like to thank Noriyuki Negi (Center for Radiology and Radiation Oncology, Department of Medical Technology Support, Kobe University Hospital) for technical assistance. This study is not supported by research grants.